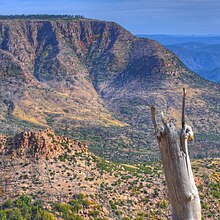 The Mogollon Rim ( /mʌɡɪˈjoʊn/ or /moʊɡəˈjoʊn/ or /mɒɡɒdʒɔːn/)   is a topographical and geological feature cutting across the U.S. state of Arizona. It extends approximately 200 miles (320 km), starting in northern Yavapai County and running eastward, ending near the border with New Mexico. It forms the southern edge of the Colorado Plateau in Arizona. Western novel author Zane Grey built a hunting cabin on the slopes of the Mogollon Rim just northeast of Payson, above Tonto Creek. 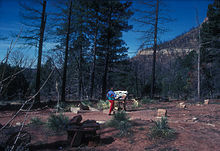 The cabin was restored by the Phoenix air-conditioning magnate William Goettl during the late 1960s, but it was destroyed by the Dude Fire in 1990. 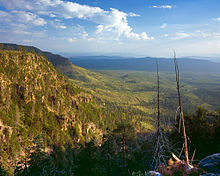 Louis L'Amour's novel The Sackett Brand, set near the Mogollon Rim, includes descriptions of its cliffs.